Canadian train trips offer stunning scenery and provide more than just transportation from point A to B. Though train travel in Canada tends to be more expensive than bus or sometimes even air travel, train travel is relaxing, scenic, and social. The romance of the train is alive and well on Canada's major rail systems. Canada's national rail system is VIA Rail, and it offers a fairly extensive system of rail transportation across the country, though not in every province. Other rail companies provide relatively luxurious, scenic adventures or unique vintage experiences. One of several scenic train runs offered by Rocky Mountaineer, the First Passage to the West between Calgary and Vancouver retraces the steps of 19th-century explorers and passes by the spot where the Last Spike on the Canadian Pacific Railway was driven. Travel three, four, or five nights through mountains, canyons, rivers, and glaciers. The Whistler Sea to Sky Climb is a three-hour journey that takes passengers past some of Canada's most stunning scenery. The train hugs Howe Sound, water inlets, Cheakamus Canyon, snow-capped mountain peaks, and an old mining town before arriving at Whistler Village mountain resort. The train runs northbound to Whistler in the morning and southbound back to Vancouver in the afternoon, so many people stay at least one night in Whistler to break up the trip. Matthew Wheeler/VIA Rail Canada Inc. This train travels 720 miles (1,160 kilometers) between the Rockies and the North Pacific Coast through remarkable and varied landscapes. 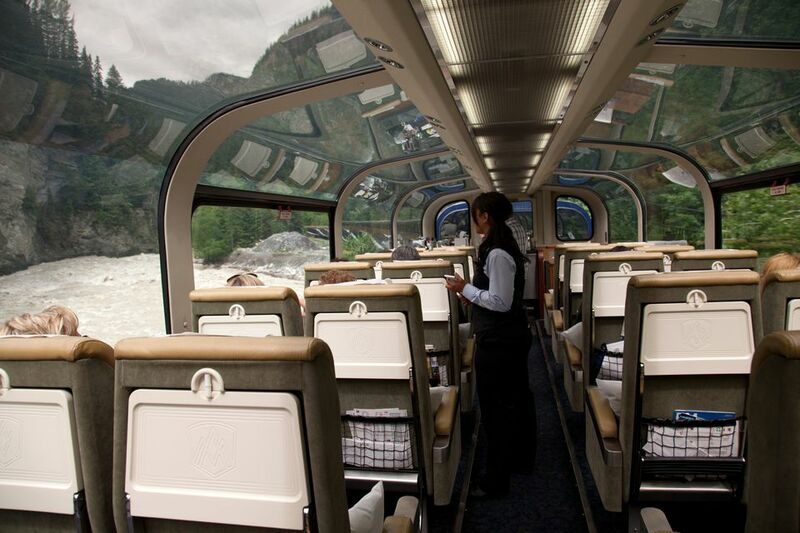 Passengers will see lakes, rivers, mountains, dotted by historic villages, farms, and sawmills out the train's windows. Wildlife, like bear, moose, elk, wolves, and eagles are also known to inhabit the area. This trip has an overnight layover in Prince George where guests can book a room at a hotel or bed-and-breakfast. The Polar Bear Express connects the coastal communities of Moosonee and Moose Factory to Cochrane, offering visitors the chance to experience the people and landscape of Northern Ontario. This trip does not have the wide appeal that Rocky Mountaineer, for example, does and is more for train enthusiasts and those with a particular interest in First Nations culture or just a desire to travel well off the beaten path. The Polar Bear Express is a traditional train with limited comforts and is notoriously delayed. The 186-mile route between Cochrane and Moosonee is scenic, but once in Moosonee, there isn't much to do. In addition, the name of the Polar Bear Express is a misnomer in that few polar bears are seen in this region of Canada. This scenic exploration of Northern Ontario takes passengers 114 miles north of Sault Ste. Marie and back again. This rugged landscape features granite rock formations, towering trestles, and mixed forests typical of the Canadian Shield. This 10-hour Agawa Canyon rail excursion includes a stunning coast down into the Agawa Canyon, at which point passengers are invited to roam the area and enjoy its beauty, including four waterfalls, close up. The Agawa Canyon train trip is particularly popular in late September to early October when fall foliage is peaking. This tourist attraction was lovingly restored by a community intent on preserving railroad heritage. Between May and October, people board this hour-long scenic journey on the South Simcoe Railway between Tottenham and Beeton, Ontario, through the Beeton Creek Valley. You'll ride in restored 1920s coaches for this vintage train trip and hear commentary from the conductor. The South Simcoe Railway is the only operating European steam engine in Canada and one of the last operating excursion steam engines in Canada. It celebrated its 100th anniversary in 2007. If you want to get a true sense of the breadth and diversity of Canada, book a trip on VIA Rail's The Canadian. This cross-country journey begins in Toronto and takes four days to traverse the more than 2,700 miles (4,400 kilometers), five provinces, and four time zones to reach Vancouver on the Pacific Coast. The Canadian showcases Canada's forests, lakes, mountains, and expansive prairie grasslands as well as the people who inhabit the cities and towns along the way: places as urban as Toronto and as remote and picturesque as Blue River, British Columbia (population 269). This two-day, 1,000-mile (1,700-kilometer) journey from Winnipeg to the subarctic region of Northern Manitoba gives passengers the chance to see the Northern Lights, polar bears, First Nations culture, and some beautiful northern landscape. This train route runs year-round, but it's between October and November that the polar bears make their trek through Churchill and can be viewed close up in "tundra buggies." On trips in the summertime, you'll see beluga whales and experience the midnight sun. This overnight, 836-mile (1,346-kilometer) trip on The Ocean route connects two of eastern Canada's most bustling cities. Though very different, Montreal and Halifax both have much to offer visitors and are excellent examples of the different cultures and history that make up Canada. Begin your journey in the early evening in Montreal, a city with one of the world's largest French-speaking populations and a culture steeped in European tradition, and end in Halifax, a busy Canadian port city that's brimming with maritime hospitality. A ride on The Ocean is a great chance to experience the romance of train travel, including sleeping and dining, and some gorgeous scenery in less than 24 hours.